I Got Your Oxalis Right Here! The name “sorrel” comes from the sour-like taste these plants give. This taste comes from oxalic acid and these guys were the first source from which this compound was isolated. I have recently read that much like most of the forbs in the Ozarks these guys were used by Native Americans and early European settlers as a food source to spice up salads as well as having intended medicinal values. Don’t eat too much, however, as the concentrations of oxalate in these plants are even higher than in spinach and tea and apparently kidney stones could be a consequence. 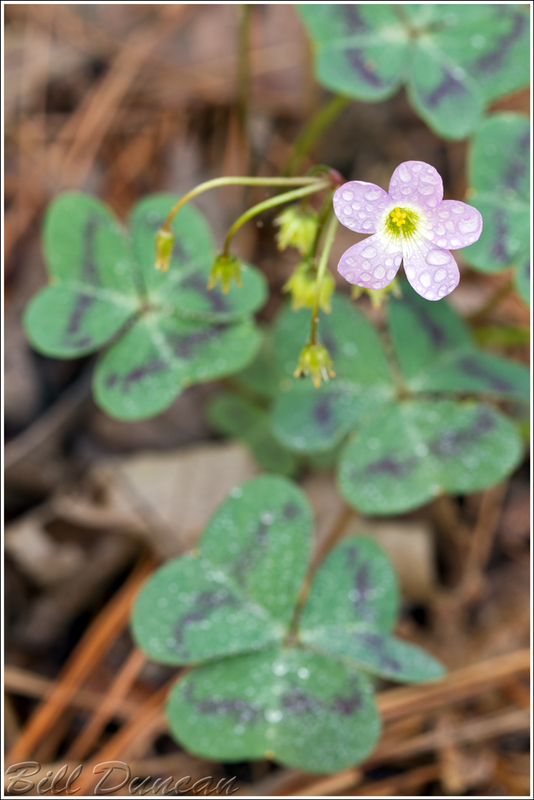 Violet wood sorrel grows from tiny bulbs beginning in mid spring in the Ozarks and is usually found in acidic, rocky open woods, fallow fields, prairies and roadsides according to Steyermark. These guys will bloom multiple times across the growing season, usually following a cool rainy spell. I spent most of yesterday hiking Hawn State Park, where these guys were one of the most abundant wildflower in bloom. I hiked all three loops, Whispering Pines North and South and the White Oak trail for the first time in one day. Including the connector trail I believe this was a bit more than 15 miles. With my 27 pound pack and lunch + water, let me tell you I felt it during the last five miles or so. I didn’t take the camera out much, being mostly interested in the hike and not seeing too much that interested me composition-wise anyway. I’m still stunned about the schedule spring has taken and I can’t stop talking about it. I went to Hawn hoping to time the bloom of the wild azaleas, which usually do not start to bloom until the last week of April or the first week of May in the park. Yesterday I found only two or three bushes that were still in bloom along sheltered north-facing hillsides. The rest had bloomed and were nearly in full leaf! Everywhere I look vegetation is 4-6 weeks ahead of typical schedule. I was waiting to see if bird migration might be early as well. We have seen some evidence of this. There have been reports already of new early arrival state records of warblers and yesterday all the usual nesters seemed to be in the area and setting up territories. This time of year at Hawn can be quite useful for the birder-by-ear. Yesterday, several hard-to-discern trillers could be found and compared in the field at one time. Within my hike I found the Pine and Worm-eating Warblers, the Chipping Sparrow the Dark-eyed Junco and Swamp Sparrow all singing their trill-like advertisements. Every spring it seems like I have to start my ear from scratch, the Worm-eating Warbler being the most distinctive to me. After a couple weeks I finally think I make some progress and then forget again soon after. Usually I can go by location; the Junco leaves pretty soon and the other two sparrows are usually found in more open, grassy habitats, which leaves the two warblers to discern. There, as its name suggests, the Pine is found in concentrations of the short-leaf pin in our region and the Worm-eating is more often found amongst deciduous tree tops. Yesterday was a glorious day for hiking at Hawn S.P. As usual, I was surprised but pleased that I did not see more folks on the trails. If a day like that can’t tear you away from the couch I don’t know what can.